He stands at the corner of Santa Fe and Mississippi. One hand mightily grasps his scepter, the other rests confidently on his hip. His crown rests cocked, while he strongly looks over his empire, confident that he stands above the rest. And he does. I first visited the Breakfast King in the autumn of 2005. It has remained the Standard for breakfast joints to live up to, and thus far, the King still remains in control of his subjects. The threat of revolt is low, for few can combine the atmosphere, wait-staff friendliness, and more than merely edible food into one top-notch diner experience. Very little has changed at the King since my first jaunt across the country and this is a good thing. Smoking’s been subtracted and Wi-fi added; nothing more. It still feels like walking into a Tarantino film, though Jewels and Vincent are notoriously absent. The lush orange booths are large and welcoming while the matching table-tops beg for elbows connected to arms connected to hands holding mugs that’re ready for re-fill after re-fill of coffee which the more than wonderful waitresses (complete with outlandish eye makeup) will drop into your cup long before it approaches empty. The register remains a relic from days gone by further adding to the King’s delightful charm. Beth Carlton was our waitress on this mild August morning. 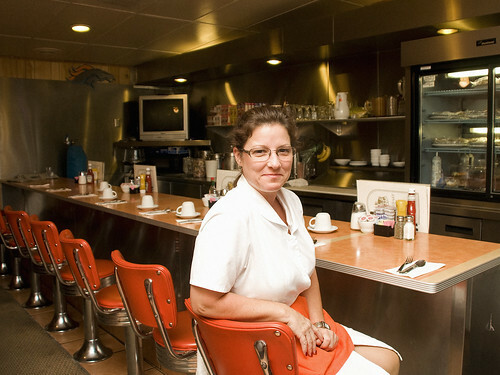 We watched her whir around the diner floor, from table to table, smiling and sitting with her customers to take their orders. What a doll. I ordered the Denver Omelette (what else!? ), adding jack cheddar and tomatoes to it at a scant sixty-cent upgrade. Your choice of bread (I took Rye) and potatoes (I suggest the Chulupa Hot Sauce to top them with) are included with all Omelettes. The Omelettes are massive and cooked with care. Despite my all too strong bias for this place, there are fewer places I’d rather purchase one. Our group was large and we were in and out in under an hour, but for those of you who like to linger, there’s a long silver bar for just that. Susie, Beth or any of the other sweethearts on staff’ll keep ya company there while you read the Post or catch the morning news.